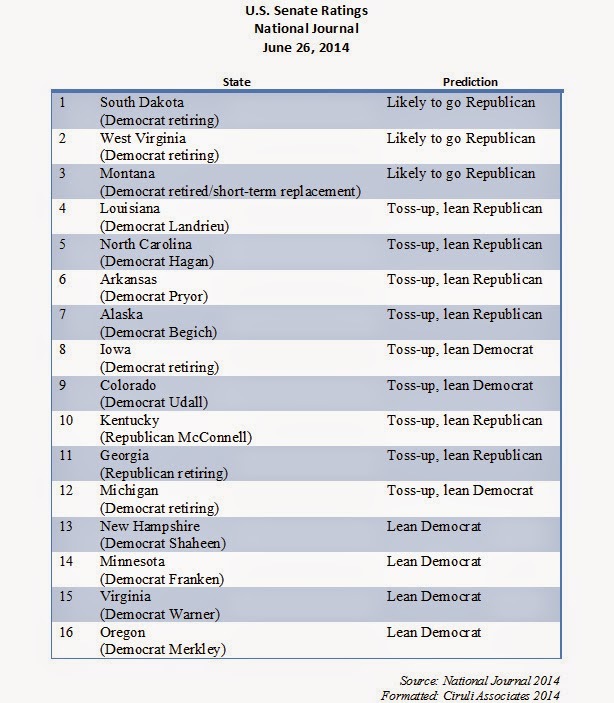 Colorado has been moved up two spots in the latest National Journal ranking of sixteen competitive U.S. Senate races. The Journal predicts a 5- to 10-seat win for Republicans. They need six to take control of the Senate. The Udall vs. Gardner race is now listed 9th, up from 11th, largely based on the equal flow of advertising dollars, recent polls and the fracking debate. The Republican primary just helped Cory Gardner by handing off the gubernatorial nomination to establishment representative, Bob Beauprez, with a reasonably unified party. Democrats are not certain to lose six seats however. Early polling from Arkansas, Louisiana and North Carolina, for example, show endangered Democrats more than holding their positions. Although races can still be decided in the last few weeks (Bennet pulling out a 2010 late win over Buck), high-profile senate races are increasingly decided before Labor Day. If a challenger is viable on Labor Day (i.e., a net positive favorability rating), the incumbent is in serious trouble, which is why there is so much early negative advertising. The top ten Republican voting counties split between Bob Beauprez, the eventual winner, by 13,000 over Tom Tancredo, who did well in Denver and its suburbs. There were 382,000 votes for the governor nominees and 399,000 total for all offices. As we predicted last Friday, Republican turnout in the governor’s race was unlikely to reach 400,000 voters (which was the 2010 turnout). The total Republican vote, all races, all candidates: 398,620. Bob Beauprez won an impressive 30 percent of the vote competing against two other candidates for the “anybody but Tancredo” vote. Beauprez must now rapidly find money for television, unite the party and watch his next few weeks of comments – official and off-the-cuff – because media and Democrats will be trolling for the faux pas that can make it into advertisements and, most importantly, will demonstrate to the independent expenditure committees (without talking to them) that this race is or is not worth investing in. The money players are all in for the Senate race, but the governorship will take some convincing that this is not Beauprez’s 2006 race. Majority Leader Eric Cantor’s demise has generated a host of “the Republican Party is hopelessly divided” commentaries and analyses. And clearly, the party has its challenges. Although, as the forecasts for the 2014 election add district- and state-level polling to voting history and the national polls, the House clearly appears to be safely to remain in Republican hands and most Senate handicappers continue to predict a 4 to 8 seat Republican pick up, making control very possible. But what the steady stream of stories that Republicans are doomed miss is that there are signs that Democrats are about to begin their own crisis of confidence and unity. A national party controlling the White House sinks or swims with the President and the administration is taking water. When public confidence recedes like the tide, candidates begin to abandon ship. Differences in interests and viewpoints tend to become more visible and more likely to be fought over. Colorado as a bellwether state is demonstrating many of the fractures that will frame the 2014 election and gain higher national profile as the 2016 presidential campaign begins. The party’s environmental wing is fighting openly with the party establishment over the role of the oil and gas industry. In Colorado, fracking is the cutting edge issue and its contribution to global warming vs. the economy. The differences may make the November ballot and harm the Democratic ticket. Liberal education reformers, leaders in the minority community, the progressive business community and many members of the party establishment are at loggerheads with organized labor over changes in education policy. The fight divides Democrats from legislatures to the school districts. The administration and Democratic congressional leadership have called for local Democrats to embrace the Affordable Care Act. In states like Colorado that is a non-starter for Democrats like Mark Udall and Andrew Romanoff, who are in competitive races. The latest national polls affirm Obamacare is a drag on Democratic candidates and could get worse if health care prices start to climb. As the gun control recall of Colorado Democratic state legislators last fall demonstrated, the party has problems with its blue collar and more socially conservative voters. The party’s new coalition of the rich, well-educated and very poor has left out much of its traditional working class and old ethnic voter base. And, the new party elites are socially liberal, brightly green, and hostile to many traditional Democratic Party policies and union-type perks. These stress points are already visible in Colorado, and as President Obama continues to recede as a unifying figure, they will soon be visible nationally. of the book will give her six months to remember what presidential hardball politics is like. 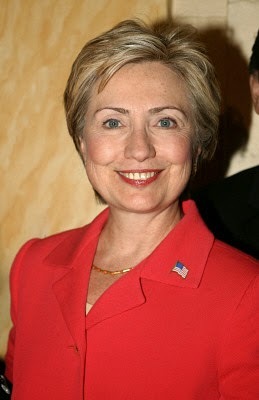 Clinton’s last experience of day in and day out political battle was in the 2008 primaries with Barack Obama. She lost and it was brutal. But, four years as Secretary of State provided a more neutral space and high favorability. She gained celebrity status without the partisan’s edge. But, the seeming inevitability of her run and the campaign quality of the book tour remind people of the partisan Hillary. Her favorability rating is starting to slide as Democrats continue to rate her in the ‘90s, but the Republican rating drops in half (41% from mid-2012 to 21%) and independent voters put on a more cynical lens (65% to 49%). She must also contend with a president whose favorability has declined from 58 percent in late 2012 to 47 percent today, respond to nearly daily foreign and domestic crises, and get through a midterm November election that could damage the Democratic brand and leave the party in disarray. It will provide a stiff challenge to successfully maneuver and a lot for her to think about between now and yearend. 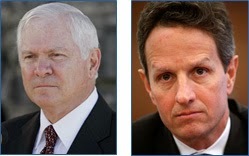 Gates and Geithner Agree. Washington Politics at Crisis Level. Two of the most engaged and critical participants in U.S. military and economic policy in the last decade agree Washington is broken and its dysfunction is contributing to our national drift and weakness. Robert Gates in recent speeches and his book was angry when he discussed the politics of Washington and its effect on national defense. It is not surprising that trust in government is at a 20-year low (Gallup, 19%, Sept. 2013) and approval of Congress is near single digits (13%, Real Clear Politics, June 2014; 7%, Gallup, June 2014). New Republic: Why is Robert Gates angry? Unless there is a late flurry of voting to match the late step-up in media advertising, projections of about 400,000 Republican primary voters may be high as only 240,000 ballots have been turned in by Thursday. In the final days of news watching (print and online), Tom Tancredo is on the defense over drugs. Scott Gessler has disappeared and Mike Kopp, due to Bill Armstrong, appears to have some momentum. 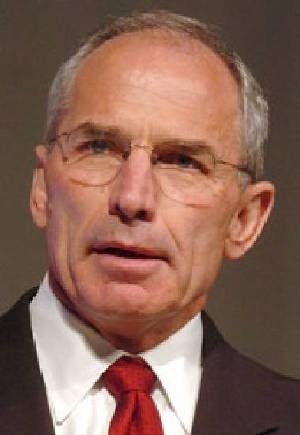 Bob Beauprez is holding his position. Going into the final stretch, it still appears to be a race between Beauprez and Tancredo. 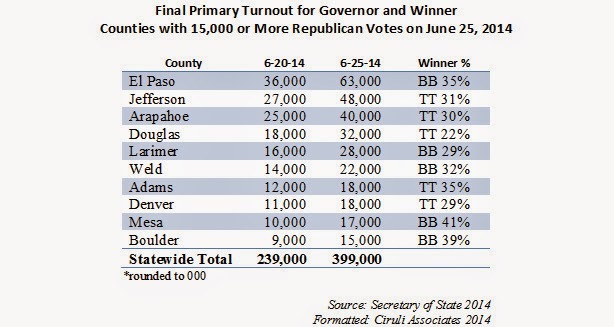 Colorado’s ten largest counties will produce the bulk of the vote for the Republican governor nominee (Mesa will slip ahead of Pueblo). They represent 75 percent of the Republican vote, with El Paso, Jefferson and Arapahoe counties accounting for half of it. Colorado, after more than a decade of being a swing state first telling the story of the emerging Democratic majority, is still at the top of the news – now describing the fracturing of the Democratic Party over fracking. The North Front Range has become a battleground with state and national consequences. The anti-hydrocarbon environmental movement has joined in a powerful union with local residents concerned about normal NIMBY issues of traffic, noise, dust, water and air pollution and aesthetics that accompany any major industrial expansion – in this case, gas and oil development. Together they have defeated expensive gas and oil campaigns to pass bans and moratoriums in four North Front Range cities. And now they are gathering signatures for a statewide ballot initiative that could ban gas and oil exploration in large sections of production areas. A fix, which would give local residents more control over their land use, is being overridden by the ideological forces that see benefit in a November ballot battle. This will be an existential battle over the future of gas and oil production in Colorado, and the outcome is uncertain. Along with Washington Post and New York Times, the conservative press and networks are drilling down on the implications for Democratic politics from a fracking ban in the November election. Much of the party establishment wants regulation, but not bans, and most of the party grassroots and environmental left want to limit natural gas production as much as possible. The next confrontation will be primary night in Loveland as voters get to vote on the latest indefinite fracking moratorium. Jillian Kay Melchior in the National Review Online carries the latest view, “Fracking Fracas in Loveland,” June 17, 2014. Floyd Ciruli, a Denver-based independent political consultant, calls Colorado “ground zero for a great hydrocarbon battle in the country.” The Loveland vote, he says, will test whether environmentalists can gain by pursuing strategic local-level restrictions against fracking. But these local votes, paired with proposed state-level ballot-initiative efforts, have created a major fault line among Colorado Democrats. Tom Tancredo’s surprise over attack ads on his libertarian drug views lacks credibility. His endorsement of legalization of marijuana in 2012 was a major coup for the pro pot proponents in Colorado and a surprise to most Republicans. It was also out of alignment with party members who told pollsters in October 2012 before the vote, which was approved by 10 points, that they opposed it by 38 points (29% favor, 62% oppose, PPP, Nov. 5, 2012). Tancredo’s libertarian musings on legalization of all drugs is both believable and confirmed by his admission that he has gone “back and forth on legalization of hard stuff” and he can “understand the theoretical line” that gets to legalization (Denver Post, 6-19-14). It is ironic that Bill Armstrong may be ending Tancredo’s election career because it was former Senator Armstrong’s endorsement of Tancredo for Congress in 1998 that gave him a final push in the five-person primary field. Tancredo declared: “Armstrong’s endorsement was worth 5 percent of the vote” (Almanac of American Politics, 2000). Bill Armstrong’s endorsement of another candidate and joining in a high-profile attack ad demonstrates that Tancredo has worn out his welcome with some influential old friends and allies. Movement in public opinion can be a great danger to politicians and the President’s approval rating is falling as fast as Mosul. His Real Clear Politics average approval was 44 percent on June 1st and dropped to 42 percent June 18, with the most recent Gallup polling (6-18) placing it at 41 percent with a 54 percent negative and a 13 point negative difference. Foreign policy, which was not expected to be an issue in the 2014 election or even a major focus of this administration (but for ending all combat operations), is now consuming the administration’s limited reserve of credibility and adding to the Democrats considerate burdens in the 2014 election. The President’s weak foreign policy approval numbers (38%) now rival his poor economic performance approval and both are helping sink his overall approval. The President’s foreign policy and national security teams are on the defensive with calls for their ouster. They were surprised by the Ukraine and now Iraq and largely play catch up. Add the prisoner trade and VA mismanagement, and even the President’s core base of approval appears to be eroding. Barack Obama began his presidency with a Nobel Prize and the support of the mainstream press, ﻿﻿﻿﻿foreign policy establishment and the public. As of June of his sixth year of office, he has lost the majority of the public (39% now approve his performance, Real Clear Politics, May 2014) and the major editorial pages range from hostile to very disappointed. The liberal foreign policy establishment remains supportive of his principles, but has become critical of the President’s level of engagement and execution. ﻿﻿Obama’s foreign policy has utterly lost the Washington Post editorial board, which writes highly critical editorials on a regular basis arguing that his sole-minded focus on withdrawal is inadequate to the new challenges and his rigid view that military engagement must be avoided or only exerted in stealth Special Forces attacks or with drones is defeatist. Unfortunately, foreign policy allies tend to lose confidence and adversaries take advantage of drift and weakness. America has two and one-half years to hope this administration can find some minimum offensive strategy to hold now frequent crises at bay. Floyd Ciruli directs the Crossley Center for Public Opinion Research at the Korbel School at DU. About half the Republican primary vote has been mailed in. The party is deciding between sending a message with one of the loudest and longest running firebrands in the U.S. – Tom Tancredo – or focus more on trying to win the race for governor and importantly doing no harm after a decade of lost races. Since 2004, the powerful, even dominant, Colorado Republican Party has lost control of both Senate seats, the governorship and both houses of the legislature, even after a mild recovery in the 2010 election. Tancredo is the frontrunner, largely due to his base in the party’s conservative wing, his talent of getting publicity and the fact he can win with less than 30 percent of the vote due to a four-candidate race. 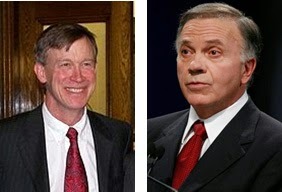 The winner could be governor, but will need to run a very smart campaign, and it’s unlikely Tancredo’s maverick career will attract sufficient moderate or independent voters needed to win in Colorado in 2014. Ciruli says the establishment would rather not have a firebrand like Tancredo, whose controversy could jeopardize fellow Republican Cory Gardner’s run for U.S. Senate. It may be getting late in the election season for apologies for mistakes in the 2013 legislative session. Democratic legislators are fiercely supportive of the substance of their new laws on gun control, civil unions, illegal immigrant tuition and rural renewable quotas. But, they would like to forget the blowback of recalls, resignations, secession and massive election defeats ($1 billion in new taxes). So they would appreciate if Governor Hickenlooper, always anxious to be liked or at least forgiven, would stop apologizing. As one liberal blog pointed out (coloradopols.com), Republican sheriffs are unlikely to warm up to him and certainly won’t vote for him. Hickenlooper is just giving Republican candidates for governor a chance to remind their voters what they disliked about the 2013 session and Hickenlooper’s role in it. Bill McInturff, a top Republican pollster, said at the recent convention of pollsters that Obamacare was the gift that would keep on giving to Republicans. In spite of the White House’s effort to delay the most onerous aspects of the law, sooner or later (likely before the 2016 presidential election) most of the controversial and burdensome aspects of the law – primarily the mandates – will be functioning. McInturff suggested the failed ACA rollout will be seen as having the same impact as Watergate for Nixon, the hostage crisis for Carter and Katrina for Bush. But, bottom line is rates will go up and support for Obamacare, which is already in negative territory, may slip further, affecting Democrat candidates in November. Gallup reports that despite the Obama administration’s claim of higher than expected enrollment, the ACA still has only 43 percent of the public’s support. Gallup reports few Americans believe the ACA has helped them (24%) and most believe it has had no effect (59%). Bloomberg reports 53 percent oppose the law, although only 32 percent want it repealed, which is down. But, 58 percent believe President Obama mismanaged the issue. FoxNews reports 55 percent wish the law never passed, including a quarter of Democrats (25%), a majority of independents (58%) and most Republicans (85%). The Secretary of State Office reports, as of this weekend, 149,000 Republican votes have been cast. 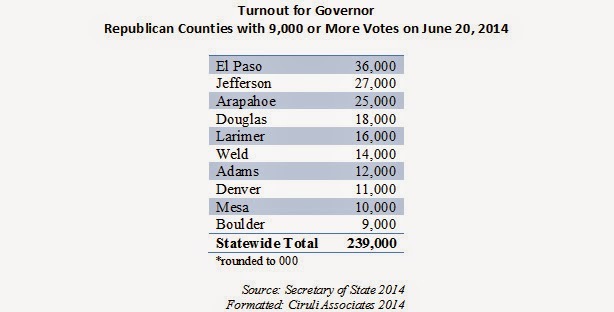 The Republican vote in 2010 for governor was 390,000. Hence, if the voter turnout this year is similar, a little more than a third of the vote is in. 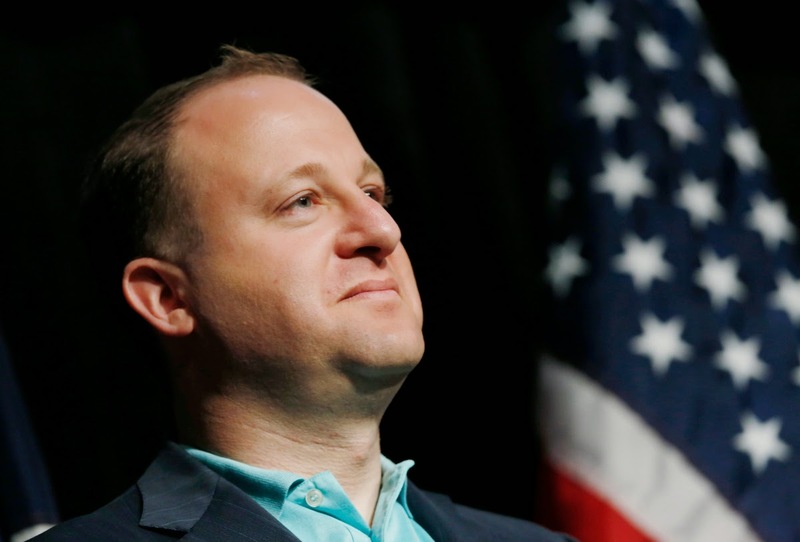 The Governor’s effort to forge a compromise on the fracking wars has stalled, and as he puts it, all sides “are furious.” Both Hickenlooper and Congressman Jared Polis are under attack. Ironically, the greatest hostility they are facing is coming from their putative allies. Major parts of the industry are opposing Hickenlooper and the compromise as too risky and not needed. Environmentalists have taken on Polis for selling them out. And, both groups complain they weren’t invited to the negotiating table. War chests are being built. Pro-industry forces have raised nearly $10 million. But, as the fracking votes in North Front Range cities showed last fall or the Cantor-Brat race last week, money doesn’t defeat a well-positioned idea. A compromise is still likely a smart strategy. 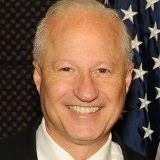 Denver pollster Floyd Ciruli said there’s obviously a “very serious disconnect” between Polis and the anti-fracking movement. Ciruli predicted Initiative 75 would gather enough signatures to qualify for the Nov. 4 ballot, whereas the Hickenlooper and Polis compromise appears to have run aground. Today was a strange day for news about Senator Mark Udall. It was announced President Obama will come to the state for a fundraiser. 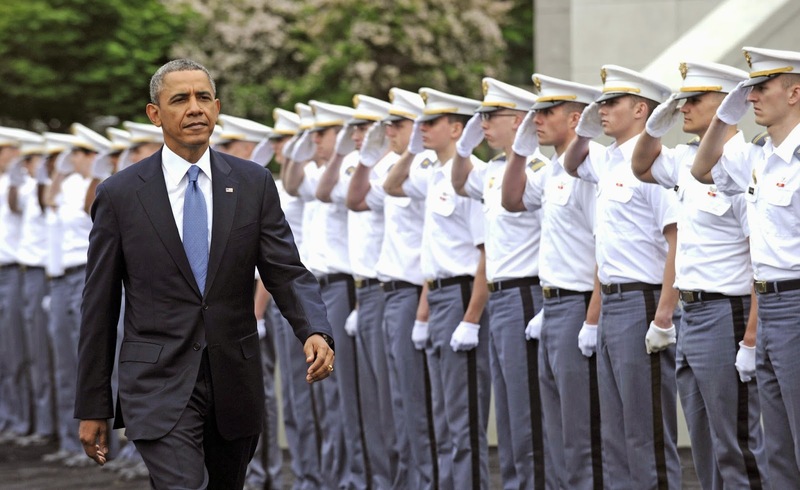 Although having Obama visit early is less hazardous than late, it hardly provides a lift. 9News reported Udall will vote against the Keystone XL Pipeline. A controversial decision out of alignment with two-thirds of Coloradans. 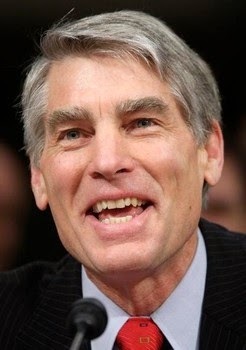 In a fundraising e-mail, Udall is touting that he’s losing to Congressman Cory Gardner by 2 points (47% to 45%, National Mining Association, 6-12-14). Wow. The pundits and forecasters assumed the race is close, but that Udall was up by 1 or 2 points. Udall claims he’s losing. If true, not good for an incumbent senator and hardly helped by a visit from an embattled president who is hanging on to an approval rating barely above 40 percent or embracing the minority position (which will be labeled anti-energy independence and anti-jobs) on the highest profile environmental issue in the country. In what must be the worst week since the Obamacare rollout last November, President Obama has been battered with the VA scandal, the Bergdahl prisoner exchange and now the fall of Mosul. Beltway Democrats appear ready to bolt, only restrained by the realization that any signs of disarray between the President and congressional/interest group wings of the party will only heighten vulnerability and intensify problems in November. Possibly the President’s best and only help is that about two-fifths of the public continue to approve his performance, a number that has held steady the last few weeks, and represents a slight improvement from the Katrina-like disaster of the 2013 ACA debacle. If his approval starts to head down as President Bush’s did in 2006 (it hit 37% on Election Day), expect the party to panic. Does Eric Cantor losing his primary to an anti-establishment, anti-immigration Tea Party-like insurgent portend for the June 24 Colorado Republican primary? Much will be made of the wider meaning of the Cantor loss. It may be of limited effect since there are only a handful of Republican primaries left this year, but Colorado is one of them. Voting has started in the four-way races for governor and Fourth Congressional District. Low turnout makes races less predictable, and in Republican primaries, more conservative. The immigration issue is back due to talk radio celebrities and the recent flood of juvenile illegal immigrants in Texas. Tom Tancredo, the leading anti-illegal immigration candidate, has been downplaying the issue (as have most Colorado Republicans) to reduce the controversy around his quest for the nomination, but he is the winner if that is the issue that frames primary voters’ views. Talk radio can be powerful in primaries, especially with star performers, such as Laura Ingraham, Ann Coulter, Mark Levin and Glenn Beck. They were relentless against Cantor. Peter Boyles has been working the anti-establishment and immigration themes. Does he and his talk show colleagues have the reach to make a difference in Colorado? Anti-establishment sentiments are affecting both parties. Ask Gov. 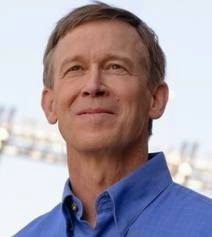 John Hickenlooper who has an angry left attacking him daily. Are Bob Beauprez and Ken Buck put on the defense due to the Cantor loss? The Colorado Republican Party’s June 24 choice will greatly influence the narrative into November. As Governor Hickenlooper tries to engineer a compromise to remove some of the more credible and The Buzz: Washington Post Covers Polis and Fracking Wars, 6-2-14) of what could be the first crack in the Colorado Democratic Party’s unity. Jack Healy in the New York Times opening paragraph sums up the view Colorado is ground zero in the nation’s and especially the Democrats’ climate and energy fractures. DENVER — An impassioned national debate over the oil-production technique known as fracking is edging toward the ballot box in Colorado, opening an election-year rift between moderate, energy-friendly Democrats and environmentalists who want to rein in drilling or give local communities the power to outlaw it altogether. As I opine, the most at risk interest in the fight is the Democratic Party establishment, which is watching a revolt of its environmental rank and file, many of whom would ban all gas and oil production if they could to force their utopian dream of renewable energy now. Just like in 2010 when Colorado Democratic money players helped Republican gubernatorial frontrunner Scott McInnis sidetrack his career, they are again spending money to help what they consider a surefire loser against Governor John Hickenlooper – Tom Tancredo. As a tertiary benefit, they see Tancredo, historically a flamethrower of a candidate, not only self-immolating, but burning down the entire Republican ticket. If Tancredo wins the primary, the stealth Democratic Super PAC will then attack him as an extremist, representing a party prone to anti-immigration candidates and philosophy. The next time Democrats try to climb to the high ground and condemn some misbehavior of Republicans, the primary of 2014 should be remembered. Reported in Colorado Observer, Valerie Richardson; Colorado Peak Politics; Colorado Pols; Compass Colorado, Samantha Davis; Complete Colorado, Todd Shepherd; and Fox 31, Eli Stokols. Denver pollster Floyd Ciruli said the idea is to boost the Republican candidate in the June 24 primary that Democratic insiders believe will be least difficult for Gov. 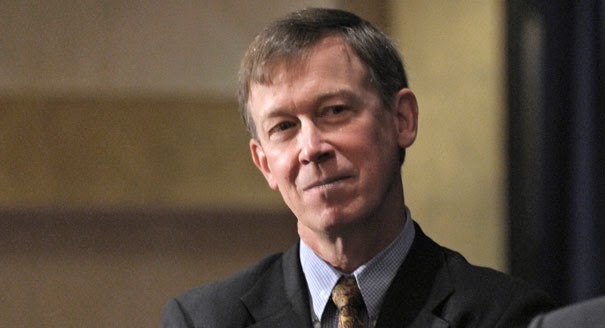 John Hickenlooper to defeat in November. Fair or not, that’s Tancredo. Ciruli noted that Democrats have played this card before. In 2010, a Democrat-backed committee invested in attack ads against former Rep. Scott McInnis, who ultimately lost the GOP primary to little-known candidate Dan Maes. Hickenlooper won the race easily against Maes and Tancredo, who ran as a third-party candidate. “I personally believe it is totally unethical, but it’s obviously not illegal, nor is it unique,” said Ciruli. Swaying a few hundred votes could mean the difference between victory and defeat in a primary contest that’s only expected to draw about 400,000 voters, said Ciruli. “If that’s the situation, then that kind of confirms what the Democrats are thinking, too: That with a relatively modest investment, well placed, they can influence this race and get what they would like out of it,” said Ciruli. and is being treated as a candidate by the party establishment, the media and the Republican Party. Eight years of a Democratic administration has worn down the brand. National Democrats still know how to campaign, but they don’t look good at governing. Clinton represents the political establishment. The Washington-New York version is even less liked than the Brussels version, which just lost seats in the EU election. The Democratic Party, as it heads to the 2016 election, is moving hard to the left. Clinton is planted firmly in the party’s center left and not anxious to advocate a host of new expensive programs and controversial regulatory and redistribution initiatives. President Obama has lost the advantage on foreign policy that he held throughout the 2012 election. He’s now being criticized by much of the foreign policy establishment and the mainstream media. Separating herself from his performance won’t be easy since she was the Secretary of State during his first term. Clinton is also challenged to appear loyal, yet independent, on the frequent new issues Obama is facing. Try as she might, every act is now seen as campaigning. Three years allows for a lot of mistakes, the media looking for new stories and voter fatigue from Clinton’s inevitability. In fact, it’s rare two-term presidents can hand off to their successor, often their vice president. Ronald Reagan did it to G. H.W. Bush, but Bush II didn’t, nor did Bill Clinton or Dwight Eisenhower. 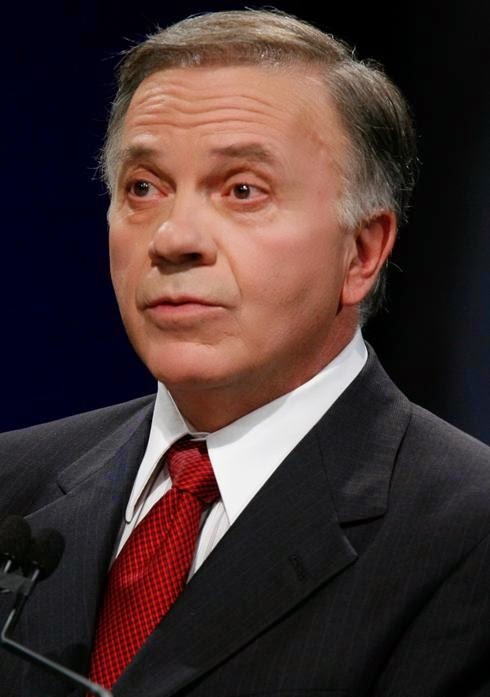 Tom Tancredo began his congressional career winning a multi-candidate race (5 candidates) in 1998 by 3 points. He received 25 percent of the vote. He may do it again in the June 24 gubernatorial primary. A new poll shows the field divided, with Tancredo and Bob Beauprez holding half the decided votes. A quarter of Republican voters are still undecided. Just when the administration and pro-immigration reform forces felt the border control issue was addressed, 25,000 children are reported crossing the Texas border the first five months of the year. The President calls it a humanitarian crisis. It’s also another administration failure and a political problem. Similar to the U.S., illegal immigration is as much of a problem in Europe. The first half of the year, the number of migrants attempting to “enter Europe illegally has surged” to more than 140,000, near the total 2013 number. Anti-immigration and anti-establishment political parties elected a record number of delegates in the latest elections for EU representatives in Brussels. Could the latest failure to control America’s borders give Colorado candidate Tom Tancredo a boost in the June 24 Republican primary? Voting starts this week. From 1993 to 1996, Bill Clinton practically moved to California. He wanted to win it big in the 1996 race. He won it 51 percent to 38 percent against Bob Dole (four years earlier, Clinton won with 46% of the vote against Bush’s 33%, but Ross Perot took 21%). 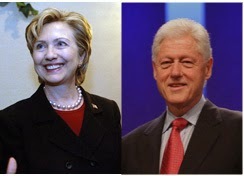 The Clintons want Colorado for Hillary in 2016, and we can expect to see a lot of them. 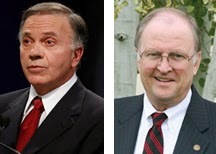 Bill won the state in 1992 against George Bush Sr. with the help of Ross Perot (Clinton 40%, Bush 36%, Perot 23%), but he lost it in 1996 against Dole (Dole 46%, Clinton 44%). Hillary lost the caucus in 2008 against President Obama. The family doesn’t intend to lose again. to be a leader of the Democratic Party and his fondness for controversial and for Democrats in 2014, divisive causes. But, in a lengthy piece, he suggests Polis is the aviator for “next issues”; i.e., pot, fracking, and the next generation, which may ultimately benefit Democrats. National Journal’s latest list of top 10 competitive congressional seats puts Colorado’s 6th District at fourth. The Cook Political Report, which provides the National Journal with its data, predicts a Republican pick-up of 2 to 12 seats. Democrats, of course, don’t agree, and need 17 to retake control of the House and bring Nancy Pelosi back as Speaker. The analysis argues that if Mike Coffman loses, it would be another blow to Colorado Republicans’ effort to regain their foothold in the Denver suburbs.